The State Emergency Operations Center (EOC) is activated at a Level III (Virtual Operations) to monitor the statewide weather conditions. At 12:45 p.m. the Colorado Division of Homeland Security and Emergency Management staff, local county emergency mangers and other state agencies that will be impacted by severe weather joined a conference call hosted by the Colorado National Weather Service forecast offices to discuss the weather forecast for the remainder of the day. 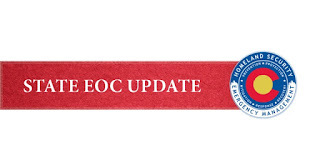 The State EOC activates at a Level III to notify all those who staff the center to begin monitoring conditions and to be ready to respond if and when local jurisdictions request assistance.